With five bedrooms, The Vines provides an intimate and discreet environment, and a home-like accommodation with excellent personal service and advice. Each room is themed to display a local iconic location. 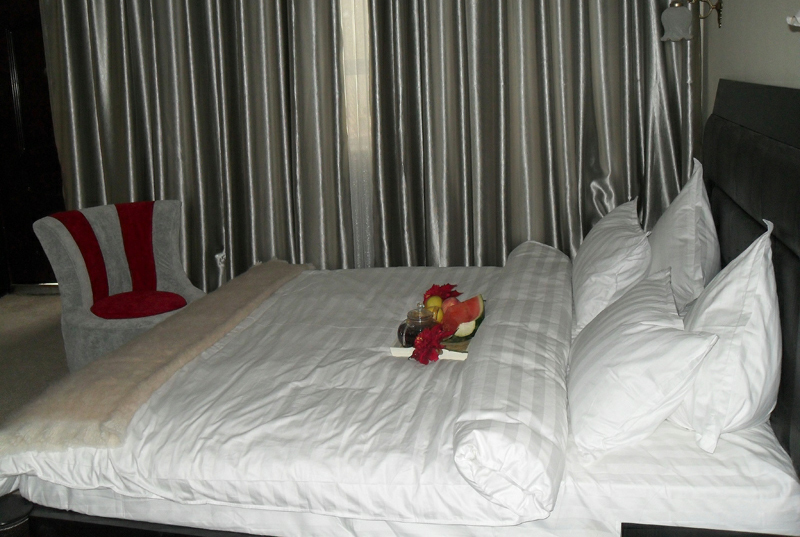 The luxury air-conditioned rooms are large (40 sq mtr) and offer all facilities. There is ample desk area, super king beds (or twin beds), wireless internet (free), TV, coffee making facilities and a full range of personal amenities. Two bedrooms in our lodge offer you super king size double beds, placed in commodious, 40m square rooms. We have named one of these the Bezalik room, after the famous Buddha caves, which you can visit a short distance from the village. And our other is the Toyoq room, called after an ancient oasis village which you will visit during your time in Turpan. 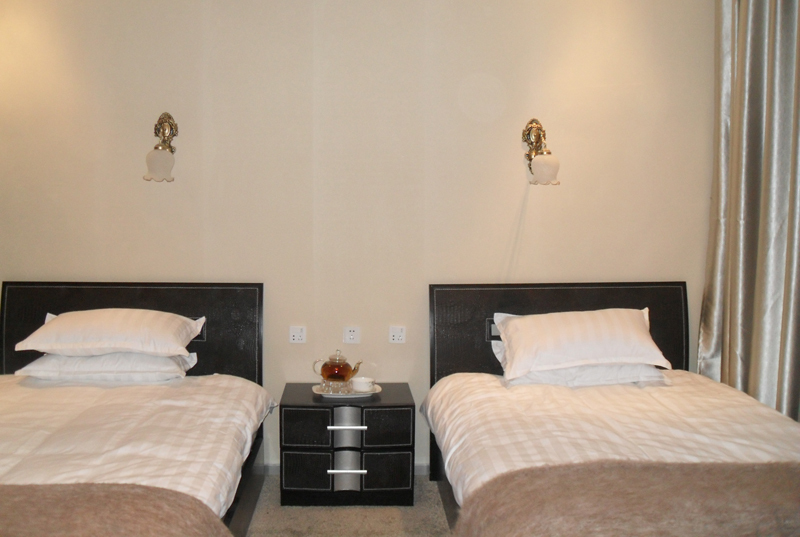 We have two rooms, each 40m square in size, with comfortable twin beds. The Jiaohe room is named after the ancient nearby town which was the local capital from 200BC. Our other twin bedroom is called the Gaochang room, taking its name from another early local town that was prominent about 2000 years ago. Your other choice of a bedrom is the Emin room. Again, it has the spaciousness and luxury of our other rooms to give you the comfort we are known for. It is named after the amazing minaret tower built in the 1800’s to reward the local population for assisting the Qing emperor’s return to Turpan. It is the world’s tallest mud brick construction. Each of our spacious bathrooms are well equipped with showers, hair dryers, and a full range of personal amenities. Cell phones are provided for the duration of your stay allowing local calls to keep you in contact with the Lodge, your friends, or your guide. Guests have access to the air-conditioned living area/library, where they can sit and browse local books, watch TV, or use the house computer (with Skype) to contact home. The self service bar in the Living Room is available to guests at no extra charge. Guests also have access to the courtyard for breakfast, for relaxing after a hectic days sightseeing, or for watching the sun go down over the vineyards with a relaxing pot of local tea or “kowas” — a traditional local cider. In traditional local style a roof area is available for relaxing and enjoying the view over the vineyards, or even for sleeping under the stars in the cool of the night (as the local Uighur do). Breakfast is served in the Living Room or in the Courtyard. A local breakfast is served, with some Continental/European breakfast options. Breakfast will be some of the freshest and tastiest food that you will have in China. Fruits, breads, milk, tea – all sourced that same morning from the local market stalls in the village. The Vines recommends frequenting local restaurants for evening meals – as the food is excellent, great value for money, and the local atmosphere is exciting. We can recommend restaurants to suit your tastes, offer menu advice and provide transport of whatever type you prefer – car, donkey cart, or something in-between. Alternatively with prior notice we can arrange a Uighur banquet in the privacy of the Courtyard of the Lodge.